Head over to Amazon to score a Twirl-a-Tie tie rack/organizer for only $2.79 with free shipping! With Dad's Day coming up, this could make a great gift if he has a lot of ties. Also, it looks like you can also use it for belts and maybe other items. It also has great reviews. No more crumpled, rumpled ties! 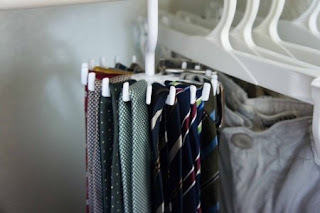 The perfect solution for hanging your ties, keeping them neat and unwrinkled. Requires no batteries or installation. Just fill with up to 20 ties, hang in your closet and enjoy knowing your tie selection is just a twirl away!